Guglielmo Marconi, an Italian inventor born in 1874, has been credited with developing a breakthrough radio telegraph system. Marconi won a Nobel Prize in physics in 1909 for his work. He was born to a farmer and as a young child, had difficulties in school. As he grew older, his love for electricity and science grew. He witnessed scientific breakthroughs at that time like the invention of radio waves. These inventions would later influence his decision to conduct some experiments of his own. In Italy, he used the attic of his home to serve as a sort of laboratory, where he wanted to learn how to utilize radio waves and integrate them with telegraphic messages. As time marched on, Guglielmo Marconi worked harder in his attic to create the radio telegraph. Eventually, he moved his laboratory outdoors for lack of room. He worked tirelessly, creating new components for his telegraphic device. Soon, he was able to transmit signal with a wire through his device. His goal was to be able to eventually get these signals to transmit throughout the city, and then throughout the world. Marconi knew if he could get more funding, more research would be done. He was fluent in English, so he traveled to England where he found support for his invention. The radio telegraph system he invented was soon able to transmit Morse Code overseas, opening the doors for military communication like never before. His invention was even used on the famous ship the Titanic. After receiving the patent for ‘wireless telegraph communication’ Guglielmo Marconi founded ‘The Wireless Telegraph & Signal Company’ in both England and the USA. The company is responsible for many notable historic events including creating the world’s first radio factory in 1898. The company received great praise after the Titanic disaster because it was due to the employees and technologies Marconi’s company that the survivors were located and therefore saved. 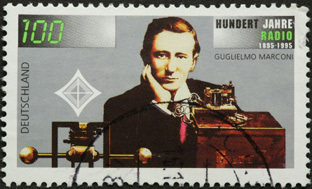 Guglielmo Marconi won several awards throughout his life. He also became an Italian Senator in 1914 and later joined the Italian army’s radio service. In 1918 he won the Franklin Institute’s Benjamin Franklin Medal. The French made him a marquess (nobleman) in 1924. He has been featured on a British commemorative coin, had statues erected in his honor all over the world including Washington, D.C., and was inducted into the Chicago Radio Hall of Fame. His legacy and inspiration still live on today in modern communications, and some claim he is responsible for inspiring the Internet, which allows signals and communications to be transported remotely all over the world. Countless tributes have been made in his honor, making Marconi one of the most influential and important inventors of all time. Biography – A biography from the Nobel Prize website. Atlantic Transmission – This page describes Marconi’s transmission of radio frequencies across the Atlantic Ocean. Marconi’s Life – An in-depth website discussing the life and inventions of Guglielmo Marconi. Radio Hall of Fame – The Radio Hall of Fame’s tribute to Marconi. Marconi & the Titanic – A fascinating story of the Titanic and how it related to Marconi’s radio company. The Invention – An early sketch of Marconi’s radio telegraph invention. Synopsis – A brief yet accurate synopsis of Marconi’s life and inventions. The History of Radio – An overview of radio and who influenced its development, including Marconi. Monument – Read about one historical Marconi monument that was created during World War II. Marconi’s Invention – More information about the first radio transmitter.